During the End Phase, if this card was Normal or Special Summoned this turn: You can target 1 Spell Card in your Graveyard; add it to your hand. You can only use this effect of "Dark Magician of Chaos" once per turn. If this card destroys an opponent's monster by battle, after damage calculation: Banish that opponent's monster. If this face-up card would leave the field, banish it instead. This monster is the cover card for Invader of Darkness, Invasion of Chaos, Dark Revelation Volume 2, and Expert Edition Volume.2. This card is a retrained counterpart of Magician of Black Chaos. This monster is the first cover card to have its TCG artwork altered. The only other cover card to have an altered TCG artwork is Junk Berserker. Oddly enough, both cards were left unedited on the covers of the TCG packs they appear on. The illustration of this card originally comes from the back cover of the Japanese official guide book for the PlayStation game, Yu-Gi-Oh! Forbidden Memories. As evident by Dedication through Light and Darkness (which this monster appears in), this monster is one of the many upgraded forms of Dark Magician. Magician of Black Chaos and Black Luster Soldier, the cards that this card and Black Luster Soldier - Envoy of the Beginning are derived from, are used in Yugi's Deck during the events of Yu-Gi-Oh!. 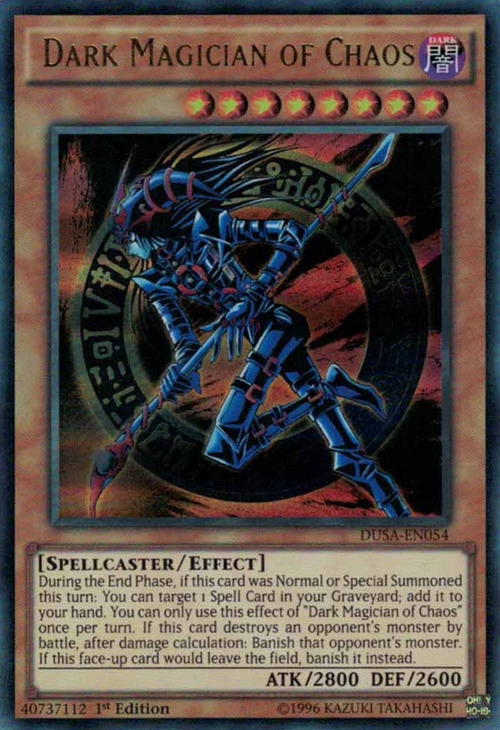 Oddly enough, they seemed to be replaced by this card and Black Luster Soldier - Envoy of the Beginning, as seen when Dimitri Duels Jaden Yuki with Yugi's Deck in Yu-Gi-Oh! GX. This card's artwork is taken from the omake page for . However, its pose is flipped horizontally. Archlord Kristya: If "Archlord Kristya" is destroyed by battle with "Dark Magician of Chaos" it will be removed from play instead of returning to the Deck. During the turn "Dark Magician of Chaos" was Normal or Special Summoned, this effect cannot be activated if it leaves the field before the End Phase, for example, by being destroyed. If "Dark Magician of Chaos" battles a monster with the same ATK and both monsters are destroyed by battle, this effect still activates, and the opponent's monster is banished. "Dark Magician of Chaos" is NOT Removed from Play if it is destroyed in your hand or Deck. You can Special Summon "Dark Magician of Chaos" with "Monster Reborn", and then return the "Monster Reborn" to your hand with "Dark Magician of Chaos" effect. If you Special Summon "Dark Magician of Chaos" face-down with "The Shallow Grave", its effect does not activate. When "Dark Magician of Chaos" is Special Summoned with "Reasoning", his effect activates. When you Special Summon "Dark Magician of Chaos" with "Last Turn", you can activate "Dark Magician of Chaos" effect. "Dark Magician of Chaos" effect targets 1 Spell Card in the Graveyard, so it will be negated by "Necrovalley" or "The End of Anubis". The Spell Card is chosen at activation of "Dark Magician of Chaos's" effect, so your opponent could chain "Disappear" or "Graverobber" to deny you that Spell Card. If "Dark Magician of Chaos" attacks a face-down "Fiber Jar" or "Cyber Jar", the Jar is removed from play but its effect is activated. If "Dark Magician of Chaos" attacks a monster with equal ATK, both monsters are removed from play. When "Dark Magician of Chaos" is sent to your hand by "Penguin Soldier", it is removed from play instead. When "Fiber Jar" resolves, a "Dark Magician of Chaos" on the field is removed from play instead of returning to the Deck. When "Dark Magician of Chaos" is removed from play by "Interdimensional Matter Transporter", it is not returned to the field in the End Phase. When a face-down "Dark Magician of Chaos" is destroyed, it is NOT removed from play. If "Dark Magician of Chaos" is equipped to "Relinquished", and is destroyed, then "Dark Magician of Chaos" is removed from play. While "Dark Magician of Chaos" is equipped to "Relinquished", you cannot select "Dark Magician of Chaos" as a card to send to the Graveyard for the effect of "Emergency Provisions". While "Skill Drain" is active, the first and second effects of "Dark Magician of Chaos" are negated, but the 3rd effect is not negated. Arcana Force EX - The Dark Ruler: You cannot send a face-up "Dark Magician of Chaos" to the Graveyard to Special Summon "Arcana Force EX - The Dark Ruler". Crystal Beast: If a "Crystal Beast" battles with a monster such as "Dark Magician of Chaos" it will be removed from play by that monster's effect, you cannot activate your "Crystal Beast's" effect. Dedication through Light and Darkness: You select the "Dark Magician of Chaos" you wish to Special Summon when you resolve "Dedication through Light and Darkness", not when you activate it. Enemy Controller: If "Dark Magician of Chaos" is Summoned, and you chain "Enemy Controller" to the activation of his effect, even if you take control of "Dark Magician of Chaos", you cannot take control of his effect, so the Summoner (the activator of the effect) gets to retrieve 1 Spell Card from the Graveyard. Forced Back: If you negate the Normal or Flip Summon of "Dark Magician of Chaos" with "Forced Back", it is returned to the hand and is not removed from play. Grave Protector: A monster destroyed by "Dark Magician of Chaos"is returned to the Deck instead of being removed from play. Imperial Iron Wall: While "Imperial Iron Wall" is active, cards that are removed from play when destroyed or otherwise removed from the field ("Dark Magician of Chaos", etc. ), will not be removed from play. If it was destroyed, it is sent to the Graveyard. If it was being returned to its owner's hand or Deck, it will be returned to the owner's hand or Deck instead of being removed from play. Last Turn: If your opponent activates "Last Turn" and you Special Summon "Dark Magician of Chaos" from your Deck, you can activate his effect to add a Spell Card from your Graveyard to your hand. Last Turn: You CAN Special Summon a high-level monster that has no Special Summoning restrictions for "Last Turn", such as"Dark Magician of Chaos". Monster Gate: If you Special Summon "Dark Magician of Chaos" with "Monster Gate", the effect of "Dark Magician of Chaos" activates, but it activates after "Monster Gate" has fully resolved and sent other picked up cards to the Graveyard, so you can use "Dark Magician of Chaos" effect to retrieve a Spell Card that was picked up and sent to the Graveyard by "Monster Gate" in the process of searching for the "Dark Magician of Chaos". Ryu Kokki: If "Ryu Kokki" battles with "Dark Magician of Chaos", "Ryu Kokki" is destroyed and removed from play by "Dark Magician of Chaos" effect, and "Dark Magician of Chaos" is removed from play because it is destroyed by "Ryu Kokki"s effect and removed by its own effect. Samsara: If "Dark Magician of Chaos" is used as a Tribute for a Ritual Summon while "Samsara" is on the field it will be shuffled back into the Deck. Snake Whistle: You can only activate this card if the Reptile-Type monster’s destruction is the last thing to occur in a chain. This is similar to the activation timing for “Dark Magician of Chaos” . Storm Caller: If a Psychic-Type monster destroys your opponent's "Dark Magician of Chaos" by battle, you cannot return it to the top of your opponent's Deck. The End of Anubis: "The End of Anubis" WILL negate the effects of"Dark Magician of Chaos"
Missing the timing: If "Dark Magician of Chaos" is Special Summoned in the middle of a chain (if it is not the last effect in the chain to resolve), the timing will not be correct for its Optional Trigger Effect, so you do NOT return a Spell Card from your Graveyard to your hand.The latest print of "Dark Magician of Chaos" uses Problem-Solving Card Text, which makes it clear that its effect activates during the End Phase of the turn it was Normal or Special Summoned, not when it is Summoned. This also means that its effect cannot miss the timing and cannot be part of Simultaneous Effects Go On Chain. This difference is due to a major change in the functionality of "Dark Magician of Chaos". When multiple "Dark Magicians of Chaos" are Special Summoned simultaneously, all of their effects activate; the controller starts putting their effects on a chain.The latest print of "Dark Magician of Chaos" uses Problem-Solving Card Text, which states that the effect of "Dark Magician of Chaos" can only be used once per turn. This difference is due to a major change in the functionality of "Dark Magician of Chaos". When you Tribute Summon "Dark Magician of Chaos" with "Sangan" or "Burning Algae", those cards effects are Step 1 of the chain, and "Dark Magician of Chaos" effect is Step 2. Burning Algae: When you Tribute "Burning Algae" to Tribute Summon "Dark Magician of Chaos", "Burning Algae"s effect is Step 1 of a chain and "Dark Magician of Chaos" effect is Step 2.